World Bread Awards Ltd understands that your privacy is important to you and that you care about how your information is used and shared online. We respect and value the privacy of everyone who visits Our Site and will only collect and use information in ways that are useful to you and in a manner consistent with your rights and Our obligations under the law. “We/Us/Our” means World Bread Awards Ltd, a company registered in England under Company number 07953680 whose registered address is Beech House, Kingerby, Market Rasen, Lincolnshire, LN8 3PF, and whose main trading address is Beech House, Kingerby, Market Rasen, Lincolnshire, LN8 3PF. 2.1 Our Site, www.worldbreadawards.com is owned by World Bread Awards Ltd, a company registered in England under Company number 07537897 whose registered address is Beech House, Kingerby, Market Rasen, Lincolnshire, LN8 3PF, and whose main trading address is Beech House, Kingerby, Market Rasen, Lincolnshire, LN8 3PF. 5.4 With your permission and/or where permitted by law, We may also use your data for marketing purposes which may include contacting you by email with news and offers on Our products AND/OR services. We will not send you any unsolicited marketing or spam and will take all reasonable steps to ensure that We fully protect your rights and comply with Our obligations under the GDPR and the Privacy and Electronic Communications (EC Directive) Regulations 2003, as amended in 2004, 2011 and 2015. This data retention policy sets out the obligations of World Bread Awards Ltd (“us/we/our”) and the basis upon which we shall retain, review and destroy data held by us, or within our custody or control. (c) Availability means that authorised users should be able to access the data if they need it for authorised purposes. Personal data should therefore be stored on the [COMPANY’S] central computer system instead of individual PCs. We shall not keep any personal data longer than necessary, but acknowledge that this will be dependent on the different types of documents and data that we have responsibility for. As such, our general data retention period shall be for a period of 6 years. Our specific data retention periods are set out below. Our Data Lead (Kathleen Codd) is responsible for the continuing process of identifying the records that have met their required retention period and supervising their destruction. The destruction of confidential, financial, and personnel-related records shall be securely destroyed electronically or by shredding if possible. Non-confidential records may be destroyed by recycling. 6.2 Data security is of great importance to Us, and to protect your data We have put in place suitable physical, electronic and managerial procedures to safeguard and secure data collected through Our Site. We have put in place suitable physical, electronic and managerial procedures to safeguard and secure the information we collect online. All information transferred is conducted through a secure connection. Where we have given you (or where you have chosen) a password which enables you to access certain parts of the Site, you are responsible for keeping this password confidential. We ask you not to share your password with anyone. 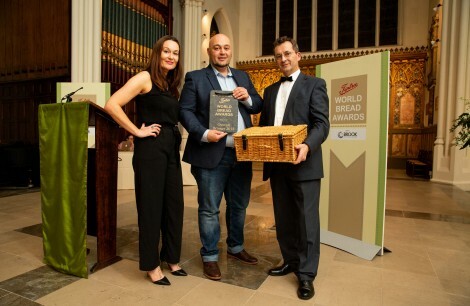 All information provided through the Site will be processed by staff operating in the UK who work for World Bread Awards Ltd. Such staff may be engaged in, among other things, the provision of support services. By submitting your personal information, you agree to this transfer, storing or processing. World Bread Awards Ltd will take all steps reasonably necessary to ensure that your data is treated securely in accordance with this Privacy and Cookies Policy. 6.3 Notwithstanding the security measures that We take, it is important to remember that the transmission of data via the internet may not be completely secure and that you are advised to take suitable precautions when transmitting to Us data via the internet. 9.1 When you submit information via Our Site, you may be given options to restrict Our use of your data. We aim to give you strong controls on Our use of your data (including the ability to opt-out of receiving emails from Us which you may do by unsubscribing using the links provided in Our emails and at the point of providing your details AND/OR by managing your Account. You have the legal right to ask for a copy of any of your personal data held by Us (where such data is held). Please contact Us for more details at kathleen@thefoodawardscompany.co.uk or using the contact details below in section 14.
place advertisements for our products on other external sites. We do this by allowing third parties including Google and Adserve to place cookies on our Site which allows them to identify your visit to our Site and preferences shown whilst on it, and your visits to subsequent third party websites in their adserving network. This allows us to serve tailored advertisements to you on those third party websites based on the information we have collected on your interests whilst you were visiting our Site. help the Site to function correctly and ensure that the ‘account, navigation and country site settings are maintained. monitor the Site’s performance and ensure that we deliver a fast browsing experience. allow you to share content with social networks, express interest in content and connect with your social media networks. to assess third party conversion by allowing us to collect anonymous data about how our marketing is performing. For more details, please refer to section 5, above, and to section 12.6 below. These Cookies are not integral to the functioning of Our Site. 12.4 Before any Cookies are placed on your computer or device subject to section 12.4 AND/OR section 12.8, you will be shown a pop-up/message bar requesting your consent to set those Cookies. By giving your consent to the placing of Cookies you are enabling Us to provide the best possible experience and service to you. You may, if you wish, deny consent to the placing of Cookies; however certain features of Our Site may not function fully or as intended. You will be given the opportunity to allow only first party Cookies and block third party Cookies. 12.7 The following Necessary Cookies may be placed on your computer or device. Necessary cookies help make a website usable by enabling basic functions like page navigation and access to secure areas of the website. The website cannot function properly without these cookies. 12.8 The following Preference cookies may be placed on your computer or device. Preference cookies enable a website to remember information that changes the way the website behaves or looks, like your preferred language or the region that you are in. 12.9 The following Statistics cookies may be placed on your computer or device. Statistic cookies help website owners to understand how visitors interact with websites by collecting and reporting information anonymously. 12.10 The following Marketing cookies may be placed on your computer or device. Marketing cookies are used to track visitors across websites. The intention is to display ads that are relevant and engaging for the individual user and thereby more valuable for publishers and third party advertisers. 12.11 Our Site uses analytics services provided by Google Universal Analytics; Google Advance E-Commerce Tracking; Facebook Insights. Website analytics refers to a set of tools used to collect and analyse usage statistics, enabling Us to better understand how people use Our Site. This, in turn, enables Us to improve Our Site and the products and services offered through it. You do not have to allow Us to use these Cookies, as detailed below, however whilst Our use of them does not pose any risk to your privacy or your safe use of Our Site, it does enable Us to continually improve Our Site, making it a better and more useful experience for you. 12.13 You can choose to enable or disable Cookies in your internet browser. Most internet browsers also enable you to choose whether you wish to disable all cookies or only third party cookies. By default, most internet browsers accept Cookies but this can be changed. For further details, please consult the help menu in your internet browser or the documentation that came with your device. 12.14 You can choose to delete Cookies at any time however you may lose any information that enables you to access Our Site more quickly and efficiently including, but not limited to, login and personalisation settings. 12.15 It is recommended that you keep your internet browser and operating system up-to-date and that you consult the help and guidance provided by the developer of your internet browser and manufacturer of your computer or device if you are unsure about adjusting your privacy settings. 14.1.1.3 You have given you explicit consent. 14.1.1.3.4 All personal data processed for profiling purposes shall be secured in order to prevent discriminatory effects arising out of profiling.